Granulomatous slack skin (GSS) is a subtle variant of mycosis fungoides that is easily overlooked on initial biopsy due to its well-formed granulomatous appearance (1). The initial clinical presentation is similar to that of conventional mycosis fungoides in that patients present with erythematous-to-violaceous patches and plaques. As the lesions progress, however, pendulous folds develop on flexural surfaces of extremities, especially the axillae and inguinal regions (Figure 3.1). Less commonly, the skin on the trunk is affected. At this point in the course of the disease, the clinical appearance is similar to that of cutis laxa. This extremely rare variant of mycosis fungoides affects middle-aged adults with a slight predilection for women in some, but not all, series (2-5). 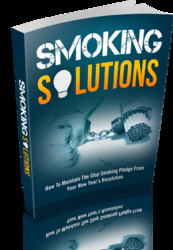 It is most common in Caucasians. 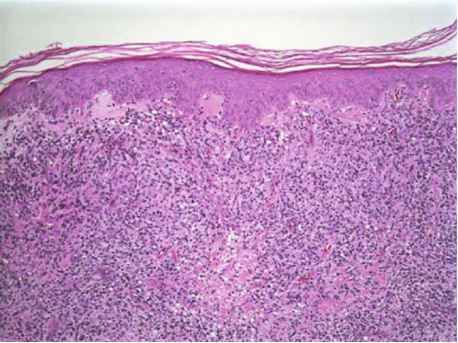 The histologic findings consist of a dense dermal infiltrate of lymphocytes that are morphologically similar to those seen in mycosis fungoides (Figure 3.2). The lymphocytes are slightly enlarged, hyper chromatic and hyper-convoluted or cerebriform. These atypical lymphocytes intercolate through the dermal interstitium. Pautrier's microabscesses may be present in some cases. Admixed is a population of multinucleated giant cells that demonstrate lymphophagocytosis (5) (Figure 3.3). 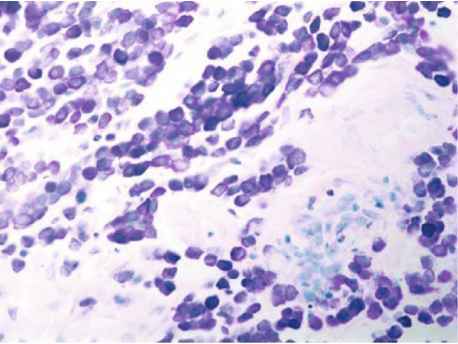 These multinucleated giant cells have been reported to have up to forty nuclei (3) (Figures 3.4 and 3.5). 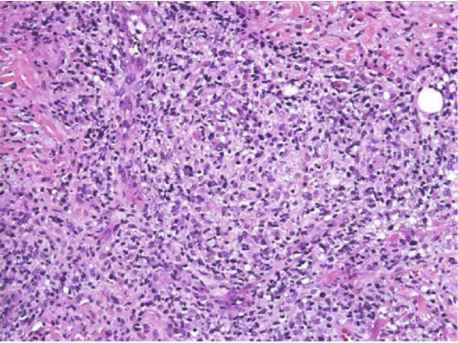 The confusing histologic pattern is the accompanying presence of well-formed granulomas comprised of mature lymphocytes and histiocytes. 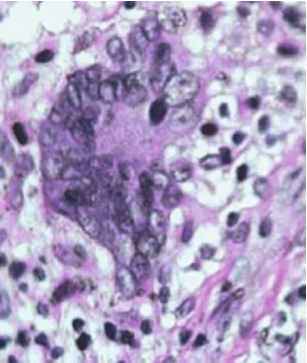 In the granulomatous areas, there is degeneration of elastic tissue fibers and some of these may be seen within reactive histiocytes. Caseation is not present. Plasma cells and eosinophils are present in most cases. These granulomas are believed to be reactive in nature, perhaps as a response to the infiltrating neoplastic T lymphocytes (3). Identical histologic changes have been reported in the spleen and lymph nodes in patients with GSS (6). Immunophenotyping reveals that the neoplastic lymphocytes are all CD3- and CD4-positive T helper cells that may demonstrate loss of CD7. Most commonly, T-cell gene rearrangement studies demonstrate a clonal population (7). Trisomy 8 has been reported within the neoplas-tic cells in several cases (3). The histologic differential diagnosis includes sarcoid-osis, though GSS demonstrates far more of a lymphocytic infiltrate than is usual for sarcoidosis. Histiocytic proliferations such as Rosai-Dorfman disease and reticulohis-tiocytoma may also present diagnostic difficulties, but the atypical lymphocytes are not present in these conditions. There is extensive histologic overlap between granuloma-tous mycosis fungoides and GSS, and many authors consider them to be identical or closely related entities (8). Figure 3.2. Low power photomicrograph depicting dense dermal infiltrate. Note the sparing of the superficial dermis (Grenz zone). Figure 3.3. 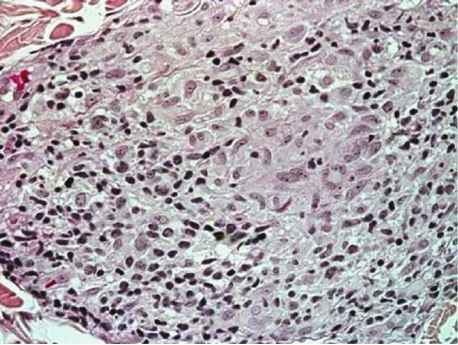 High power photomicrograph depicting nodular disposition of infiltrate in the deep dermis. Note the aggregates of larger, clearer histiocytes and smaller, darker lymphocytes. The granulomatous response is more prominent in GSS than in granulomatous mycosis fungoides for those who view the entities as differing (9). Further, elastolysis involving the entire dermis is not a feature of granuloma tous mycosis fungoides. The sharpest distinction between these entities is clinical in that granulomatous mycosis fungoides does not demonstrate the pendulous skin folds characteristic of GSS (5). Figure 3.4. High power detail of granuloma with interspersed hyper-chromatic convoluted T-cells. Figure 3.5. High power photomicrograph depicting bizarre giant cells with engulfed atypical lymphocytes. Patients with GSS may have concomitant, preceding, or subsequent development of other hematopoietic malignancies including Hodgkin's lymphoma, non-Hodgkin's lymphoma, mycosis fungoides, leukemia, and Langerhans cell histiocytosis. Hodgkin's lymphoma is the most frequent association (10). There is no effective therapy for GSS, though treatment regimens for mycosis fungoides and other lymphomas are frequently attempted.